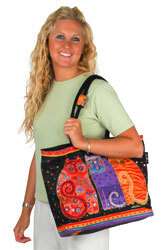 This Laurel Burch canvas purse features three colorful Cats with gold metallic accents on the front. The back of this purse is black with multi-color mini-triangle accents. It has padded handles,a top zipper closure, an inside zip pocket, a water resistant interior and two wooden ornamental attachments. Measures 19" x 5" x 15". The handles measure approximately 24" long.